Cooler temperatures do not mean the end of beautiful blooms. There are plenty of hardy flowers that thrive in the fall and add gorgeous bursts of color to your window boxes. 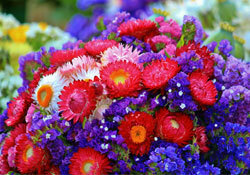 Mums are a popular choice because they grow is a variety of vibrant fall colors, but there are also other options such as Pansies and Asters which have short stems and full blooms—making them ideal for window gardens. Add draping green ivy’s, tall wild grasses or colorful ornamental Kale plants among the flowers to give your window boxes beautiful texture and variety. Flowers are eye-catching, but foliage can help round out your display with varying heights and add symmetry to make the finished product look more professional and manicured. Want to guarantee perfect plants that never wilt, die or need maintenance? Go to your nearest craft store and check out the huge selection of realistic looking artificial flowers and greenery. 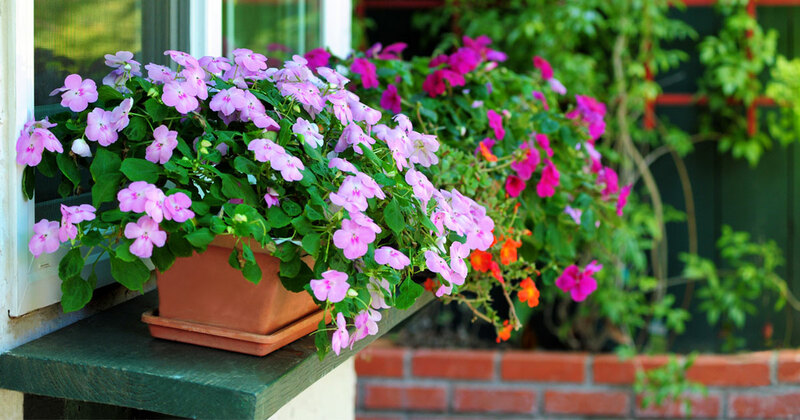 Whether you fill your whole container with picture perfect silk plants or you insert them amongst a live garden, going fake is a great way to maintain your window boxes year round without needing a green thumb. Who said window boxes are just for plants? Fall is the perfect opportunity to get creative with your window displays. Add small pumpkins, gourds or ears of dried corn among your flowers for a charming nod to the season. Line your container with hay or trim it with artificial fall leaves to accessorize. Tie ribbons around small bundles of wheat to add rustic style. The possibilities are endless, so don’t forget to add some unexpected surprises to make your container garden unique and festive. Why put your gorgeous displays in a plain plastic box when you can use your creativity to take it to the next level? Look for an oblong galvanized steel wash bucket that suits your window size. Build a box out of rustic barn wood. Bolt together some classic plastic pumpkin buckets for a whimsical look. As long as it can be affixed securely to your window and it supports the weight of your garden, it can serve as a creative window box. Just be sure to drill adequate drainage holes in the bottom. Need more inspirational autumn décor tips? Keep following our weekly blog to keep your home looking festive.